David Wilkerson, best known for his blockbuster memoir The Cross and the Switchblade and as the founder of both Teen Challenge and World Challenge, was a man devoted to seeking and serving the Lord. This April marks his one-year passing, and this devotional commemorates his tremendous spiritual legacy. Wilkerson came to know intimately and preached passionately to all: God takes delight in you--and is blessed to keep and deliver you. Complete with accompanying Scriptures, this year-long devotional journey will take believers deeper into the Father heart of God. Readers will not only glean wisdom and insight from a man sold out for the Lord, but they will encounter a loving God whose eyes are always trained on his children. 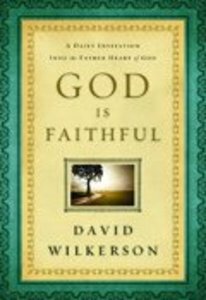 About "God is Faithful: A Daily Invitation Into the Father Heart of God"